* Israel has practiced a systemic policy of destroying Palestinian water resources and has shown that it is willing to contravene the Geneva Conventions in its use of water as a tool of coercion and control. * During military operations, Israel has targeted water infrastructure in both the West Bank and Gaza, perpetuating humanitarian crises. * Israel’s seven-year siege on Gaza must be considered part of the war on water, since in preventing supplies to repair, maintain, or develop water infrastructure, it is prolonging the damage done during times of attack. * The water war has crippled development in the West Bank and Gaza, causing economic losses in agriculture and industry, as well as long-term health concerns. * Restricting Palestinian access to water has turned what was once a community-managed resource into a commodity and is in danger of changing the relationship between Palestinians and their land. Amongst the causalities of Israel's latest assault on the Gaza Strip has been the coastal enclave's water infrastructure, which has not been spared deliberate targeting by Israeli missiles. This attack on water infrastructure is neither a new practice nor one that is specific to Gaza but is rather part and parcel of a sustained Israeli campaign to de-develop Palestinian communities and make everyday life unbearable. In order to stop Israel's deliberate targeting of water infrastructure, the damage that it has caused to vital Palestinian water resources must be recognized as systemic; it must be documented and then deterred at all levels of Palestinian society through awareness campaigns and civil society initiatives. International stakeholders like Arab League States, the European Union, and the United Nations must also pressure Israel to cease and desist. The policy of denying Palestinian communities access to water can be seen as a tool of warfare, exercised relentlessly by Israel's occupation and military authorities and ultimately undermining Palestinian resistance. The ramifications of this policy are vast. They include long-term environmental degradation, both short- and long-term dangers to public health, and the effective denial of access to clean drinking water to a substantial civilian population. "It is prohibited to attack, destroy, remove or render useless objects indispensable to the survival of a civilian population, such as foodstuffs, agricultural areas for the production of foodstuffs, crops, livestock, drinking water installations and supplies and irrigation works, for the specific purpose of denying them for their sustenance value to the civilian population or to the adverse Party, whatever the motive, whether in order to starve out civilians, to cause them to move away, or for any other motive." Israel's sustained attack on Palestinian water infrastructure has been waged on two fronts: direct and extensive damage caused deliberately during large-scale military operations, and long-term damage done by preventing the repair, maintenance, or development of water infrastructure. Though rarely on the political agenda, targeting water infrastructure has been an identified and documented tactic of the Israeli military; whether it takes the form of bombs on Gaza's wastewater treatment plant or targets Roman-era cisterns that still provide water in a remote village in the West Bank, the methods are deliberate. The United Nation's Goldstone Report that was commissioned to document human rights violations in the wake of the 2008-2009 Israeli attack on Gaza ("Operation Cast Lead") affirmed what it saw as Israel's "deliberate and systematic" destruction of water infrastructure. This year's 51-day summer assault on Gaza is no exception. During the course of the bombardment, Israeli political figures reportedly called for water supply to Gaza to be cut off along with its electricity. This is part of a rhetoric of warfare that sees water and energy infrastructure as a political weapon of coercion. In each of Israel's assaults on Gaza over the past decade, bombardments have targeted water infrastructure, from the main power stations to its wastewater treatment plants and water networks. The military actions left mains water, sewage, and other wastewater treatment capacity crippled. Reports following Operation Cast Lead showed that damages left one-third of the population in Gaza without access to water. The resulting environmental damage was estimated to be up to $44 million. In the first days of the most recent military operation in Gaza, "Pillar of Defense," Israeli aircraft targeted the sewage pump station west of Gaza City. In striking its target, Israel disabled infrastructure that pumps 25,000 cubic meters of wastewater per day to Gaza's main sewage treatment plant. Following the attack, the Gaza Municipality announced that it would no longer be able to treat sewage. Continued strikes on the facility also forced management to halt its attempts to repair the damage in order to avoid injury to staff members after seven employees were killed while inspecting the initial damages. Further Israeli shelling east of Gaza City hit a main water pipeline, disconnecting areas east of the city and cutting off the water supply to more than 1.5 million inhabitants. The losses in water infrastructure alone have been estimated at $30 million. Since the beginning of the summer assault on Gaza, the main wastewater treatment plant has been destroyed, including the network pipelines that connect to it. Four wells, five reservoirs, and countless network pipelines have also been rendered unusable. As a result, more than 100,000 cubic meters of untreated sewage has flowed through the streets of Gaza and into the sea. With no access to safe drinking water, the majority of Gaza's inhabitants must seek shelter and basic services outside their homes. Destruction of water wells and wastewater infrastructure thus augment the humanitarian crises. As whole neighborhoods overflow with sewage water, there is increasing concern of widespread health epidemics. Over-burdened hospitals must now also deal with digestive ailments, skin allergies, and water borne and respiratory diseases. One Oxfam spokesperson stated, "We're working in an environment with a completely destroyed water infrastructure that prevents people in Gaza from cooking, flushing toilets, or washing hands. The current public health risk is massive, and […] Gaza's infrastructure will take months or years to fully recover." Within this framework, the siege on Gaza can – and should – be understood as a continuation of the policy of targeting water infrastructure. With severe restrictions on what is allowed to enter Gaza, reconstruction of the sewage treatment plant following attacks sustained in 2008 has been impossible. Beyond reconstruction, regular repairs are also made impossible and upgrading to more efficient or sustainable systems out of the question. Innovations in water treatment and the building of quality of life that depends on regular access to water are thus prohibited; likewise, available resources are rapidly depleting, making future projects more difficult. Without repair, moreover, lasting damage is being done to Gaza's land. There has been a rapid seawater intrusion and over-abstraction of the aquifer for years. Even available sources of water are not always clean: 95% of the water that Palestinians in Gaza have been consuming for decades has been proven unfit for human consumption. Electricity shortages that have lasted for almost a decade have limited water treatment capacity and thus the availability of water to households, as well as increased the discharge of untreated wastewater into the sea. Even before the summer assault on Gaza, 90 million liters of untreated or partially treated wastewater were being dumped and continue to be dumped into the sea each day due to insufficient treatment facilities. Materials being allowed to enter Gaza, like generators, limited fuel, and water trucks, only compensate temporarily and aim to provide basic services and immediate relief to a displaced population. These stopgap measures can in no way address the problems of water provision in Gaza and barely alleviate the consequences of Israel's water warfare. The reconstruction phases and rehabilitation of infrastructure in Gaza will not only require millions of dollars but will also take a very long time under the prevailing conditions of siege. Even more insidious has been the slow but deliberate damage to water infrastructure in the West Bank. The same policy of intentional damage to water equipment during times of military assault has also been witnessed across the area, with the most obvious being Israel's invasion of Jenin city in 2001 and 2002, which caused massive damage 2 to water and wastewater infrastructure, cutting off water services for weeks. Infrastructure damage also takes a more subtle and slow form, where, in place of a siege and blocks to material imports, demolitions have become the norm, especially in marginalized communities in Area C, some 60% of the West Bank under the Oslo Accords, and in what Israel has declared the "buffer zone" around the Gaza Strip. These areas under direct Israeli control have been expropriated for "security" reasons, and are being used as military zones and army training grounds. Declaring an area a military zone almost automatically means the destruction of farmland, the threatening of lives of nearby communities, and the expropriation of large areas of land. Although tools and equipment might be available in Area C, infrastructure is as hard to build as it is in the besieged Gaza Strip. Palestinians living in this area must apply for permission to Israeli authorities in order to maintain, build, or expand water infrastructure (permission must also be sought in Areas A and B, just via the Joint Water Committee discussed below). When permission is – almost inevitably – denied, civilians are forced to build without permission. This puts them at risk of fines as well as demolition orders. According to the Palestine-based coalition, Emergency Water, Sanitation and Hygiene for Palestine (EWASH), between 2009 and 2011, 173 different pieces of water, sanitation, or hygiene infrastructure were demolished, including the confiscation of water tankers, which are used as an emergency measure when access to water is prohibited. Beyond the Israeli military's systematic targeting of infrastructure in Area C, residents of the illegal Jewish-only settlements have also been carrying out acts of vandalism and destruction that specifically target Palestinian water sources and frequently taking over natural springs for their own recreational use. Settlers can be seen as acting within a clear Israeli policy that sees such targeting of water resources as an acceptable method of warfare. The destruction of generations-old water infrastructure such as historic cisterns or springs not only deprives marginalized communities in Area C of water but also destroys an important element of Palestinian history and the community's age-old organic relationship with natural resources and legacy of locally managed resources. The same is true in Gaza, where an occupied border zone swallows up some 17% of Gaza's landmass and where 305 agricultural wells were destroyed between 2005 and 2013. This buffer zone and areas marked as C both contain the majority of Palestinian farmland, so targeting water infrastructure here has vast ramifications on both economic production and the ability of Palestinian communities to be self-sufficient. As a result of the destruction of water infrastructure on farmlands, Palestinians are more dependent on aid, on imports, and indeed on Israeli goods. Without access to regular, clean, and reliable sources of water, industrial, agricultural, and trade activities decline, causing economic meltdown. This is especially true for highly vulnerable and resource-dependent economic activities in Palestine, such as agriculture. Under such conditions, only 6.8 percent of agricultural land in the West Bank is irrigated, and the same small percentage yields half of the agricultural produce in the Occupied Palestinian Territory. This number suggests the staggering loss of economic opportunities in the agricultural sector, due solely to lost water on account of Israel's restrictions and demolitions. Estimates have put this loss of economic gain at $1.44 billion annually. Many communities depend on basic water sources such as wells, springs, and cisterns to meet domestic needs; oftentimes this infrastructure was built decades, if not millennia, earlier and is badly in need of repair. Hundreds of such communities in the West Bank suffer from deliberate damage and destruction of their water sources. Rainwater cisterns, wells, irrigation systems, and water networks built in the pre-Roman period have been targets of Israeli military forces. The effects of destroying the water infrastructure are not limited to disease, absence of basic life necessities, loss of income, or development opportunities. Over the long term, Israel's targeting of water infrastructure also deeply influences the relationship that Palestinians have with their land. By depriving farmers of water, they drive them off their land. Denying herders access to age-old cisterns cuts off traditional livelihoods and depletes resource-rich villages of jobs, families, and traditions. Within this paradigm of water war, it must come as no surprise that the water-rich Jordan Valley is amongst the most brutally attacked areas in terms of water infrastructure demolition. There can clearly be said to be a systemic water war waged against a Palestinian population. This war in the long run will destroy the organic relationship that cities, towns, and villages have with local water resources and change once locally-managed water resources into a commodity – one that is, moreover, controlled by Israel. Today's residents of Ramallah, for example, buy their water from Mekorot, the Israeli government-appointed water company. Water is no longer a community resource, and its commodification at the hands of Israel's occupation is further changing the shape of Palestinian society. The destruction of water infrastructure is a direct blow to Palestinian human development schemes that have been targeted by international donors over the past two decades. Donors pour billions of dollars into water projects in what can be seen as a donor-driven sector. What a large portion of these billions go to is the reconstruction of water infrastructure damaged by successive Israeli bombardments. At times, the high cost of rehabilitation discourages donor agencies from stepping in to repair infrastructure. This leaves communities like Susiya, in the South Hebron Hills, or Al-Farasiya in the Jordan Valley (both Bedouin or cave-dweller communities of only a few dozen each) with access to only the most immediate humanitarian relief, which comes at a lower cost. When Israeli forces take temporary water tankers away, they may eventually be replaced, but the cycle seems to preclude any long-term solution to the hamlets' water crises. Donor intervention in the water field must go from providing temporary solutions to putting active political pressure on Israel so that its military forces cease their strategic destruction of water infrastructure. 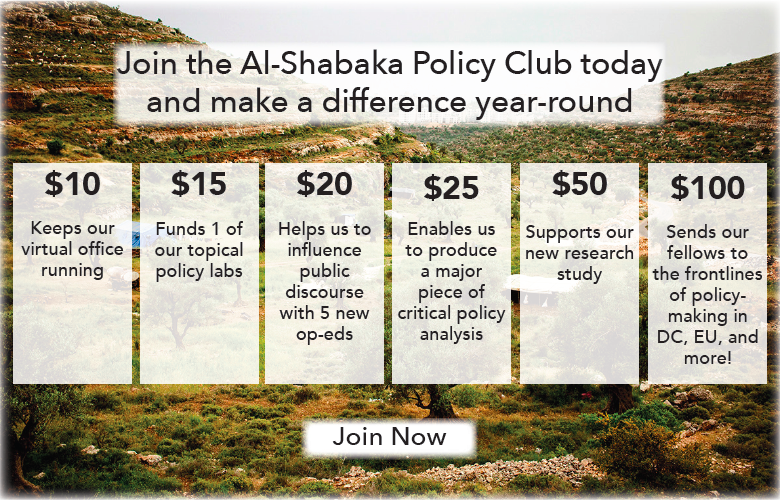 Money could then be invested in long-term development of infrastructure that would politically empower Palestinian communities at the grassroots, ensure access to clean water, and allow for the economic development of both the industrial and agricultural sectors. If Palestinians and the donor community could be assured that infrastructure was immune from Israeli attacks, the tides would turn on a policy that has left Palestinians high and dry. As a start to this process, the Palestinian Water Authority has been vocal in its condemnation of the destruction of cisterns in the West Bank. It has gone some way to document the destruction and stated that Israel's actions violate the agreement of the 2001 Joint Water Committee. The committee had been created as a mechanism to ensure Palestinian access to water in the West Bank through a water management program that aimed to keep "the water infrastructure out of the cycle of violence." However, since the committee operates jointly between the Palestinian Authority (PA) and Israel's infrastructure of occupation, it remains ultimately under the control of the occupying power. Some NGO and civil society groups are exploring alternative ways to hold Israel accountable for its water violations, actions that should be seen as a model and could be built on further. EWASH has collaborated with the Palestinian rights group Al-Haq to produce a report for the Committee on Economic, Social, and Cultural Rights. The report documents water violations perpetrated by Israel and urges action based on the UN's International Covenant on Economic, Social, and Cultural Rights of which Israel is a signatory. More of these efforts, however, are needed in order to mobilize both locally and internationally. On a community level, there is a general lack of awareness and a prevailing feeling of helplessness when it comes to realizing water rights. In order to address this, community leaders must embrace water rights as an important element in their popular struggle against occupation. This means making communities aware of their rights and working to document in a collective manner its violation, as well as to mobilize collectively to demand action. Attention brought to the water crisis in Gaza has in part spurred action in the West Bank, where campaigns have been organized to deliver water to the population albeit symbolically. These efforts can be used to foster awareness of Israel's systemic water war and galvanize action in the face of it and to allow fresh water to be delivered to the Gaza Strip. On a national and international level, there is an urgent need for advocacy to expose water violations in all forums, as well as efforts to join global grassroots campaigns for indigenous water rights. Moreover, the Palestinian Water Authority and the international donor community must be more vocal about water violations and hold Israel accountable for its crimes. Draw attention to instances of damage or attempted damage due to the targeting of infrastructure. Form coalitions for mutual support. Organize and maintain a comprehensive database of destruction of water infrastructure as well as lists of those affected and the long-term ramifications of the destruction. Put the right to water on the agenda, in particular within Palestinian popular struggle committees so that the right to water gets a place on the political agenda. Form bonds with other indigenous communities striving for water justice. Use the struggle for the protection of water resources as a locus of mobilization for global indigenous campaigns. Use its observer state status at the United Nations to hold it accountable through the UN System. Hold Israel accountable for all its human rights violations and must include the right to water in this equation. Insist that Israel compensate donors for the loss of infrastructure put in place by international bodies. Compensation for donor investments must be claimed.